This is an O guage box car and looks to be 80’s from the logo. It may be new. I don’t know. There are other older O guage cars also on my wanted list. 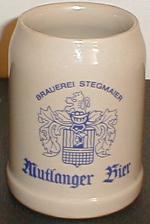 Not Wilkes-Barre, but a Germany mug from Brauerei Stegmaier. Could be some family connection here. I’ve see various flavors of the German brewery mugs on ebay. A pre-prohibition match safe. This was on ebay and advertised as guttapercha. Note the match striker on the bottom.